It’s a wonderful time of year that, for many, can cause (not-so-wonderful) results on the waistline. Keeping weight in check is hard any time of year, let alone over the holidays when we’re thrown off our regular routines and food choices. But it’s far from impossible. Holiday parties, family get-togethers typically yield indulgent foods that aren’t in our normal diet. I mean… that’s one excitement of a holiday party, right? Being surrounded with so many treats we don’t consume on a normal daily, weekly, or monthly basis? So, that begs the question…. Is it possible to find a compromise between enjoying your favorite holiday food… and also considering it healthy? Let’s examine a few popular holiday foods/dishes, as well as popular ingredients, that can be modified to fall on the “healthy side.” We promise to offer solutions that provide all the deliciousness, but save you on the guilt. Dips: Commonly found at parties or holiday gatherings, dips are a surefire way to consume way more calories and fat than you typically eat in a whole meal. Here’s an easy way to enjoy this appetizer without wrecking your diet. Substitute low-fat or nonfat plain Greek yogurt or nonfat sour cream for regular sour cream in any recipe is one of the easiest ways to cut unwanted calories/fat without sacrificing taste. An ounce of sour cream contains about 60 calories, while an ounce of nonfat sour cream has about 25. An even better replacement would be Greek yogurt: ounce of nonfat plain Greek yogurt has only 15-20 calories… not to mention the added protein. Enjoy a serving of dip, load your plate with dipping veggies, and enjoy! 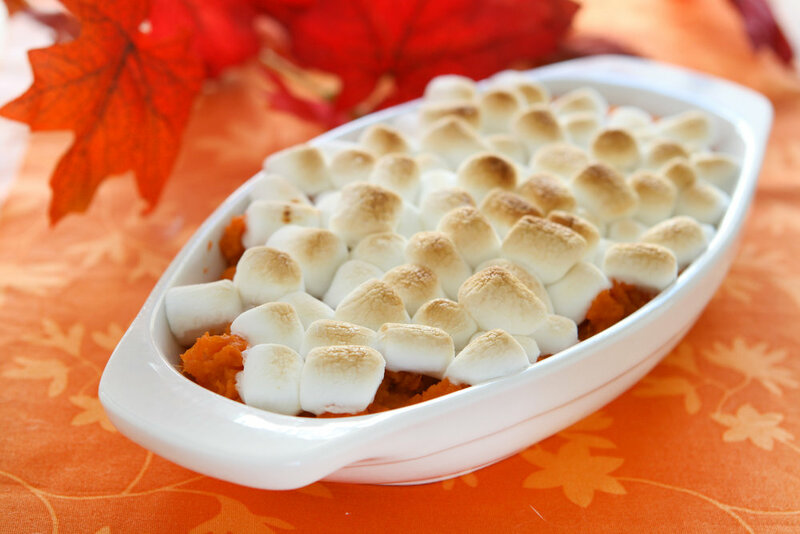 Replace Candied Yams with Sweet Potatoes: Swapping yams for oven-roasted sweet potatoes are a great option to save calories AND reap the benefits of vitamins and nutrients. Sweet potatoes offer fiber, vitamin A, potassium, and phytochemicals, which stave off aging, cancer, and arthritis. Consider adding cinnamon and/or dried pecans, both which are great anti-inflammatory foods, or for some healthy unsaturated fats, add in pecans. While sweet potatoes are naturally sweeter by nature, if you want them sweeter, sprinkles in some stevia. If you enjoy more of a savory potato, … adding some turkey bacon, garlic, onion, or any other spice you would enjoy on regular potatoes. Lower sodium Green Bean Casserole: this classic dish is a popular at many holiday gatherings thanks to its easy preparation and delicious taste. A few simple substitutions can clean up this recipe, cut down the sodium and pack it with some protein. Swap the cream of mushroom for low fat or nonfat plain Greek yogurt. It provides all the creaminess, without the fat... and adds a good serving of protein. Choosing no salt added green beans; a quick peak at the nutrition label of green beans can be a shock factor with one serving yielding 400mg of sodium. If your recipe calls for butter or chicken broth, select a no salt added chicken stock. Some versions of this recipe use soy sauce; consider a low sodium soy sauce, or a natural soy alternative such as Braggs Liquid Aminos. Natural soy alternatives all the flavor, without any of the artificial or MSGs of soy sauce. Of course, you can take this recipe one step healthier by making your own crunchy onion toppings … or use the store-bought ones, and be super proud that you already gave this recipe a makeover ten-fold with the above ingredient swaps. Stuffing: This staple at many holiday dinners can be easily modified. Adding nuts, dried fruits, carrots, and celery will provide fiber and a range of vitamins not in traditional stuffing. Most importantly, replacing butter with a low sodium chicken broth or no salt added chicken stock will keep the dish low-fat, yet moist. No doubt, one of the largest areas where over-indulgence occurs during the holidays. The amount of sugar, butter, and oils in most recipes not only are counterintuitive to your fitness goals… but the more it’s consumed, the more the body craves. So, let’s highlight a few ingredient swaps for just about any dessert that will convert the recipe to a healthier alternative. Flour: Replace traditional all-purpose flour with white whole wheat flour, sprouted almond flour, or coconut flour. Coconut flour is gluten-free, high in fiber, low carb, and a good source of protein. Recipes will likely need more liquid when using coconut flour but will require less sugar (or other sweetener) since coconut has a natural sweetness. Brownie Lovers: Substitute flour for black beans. Replace 1 cup of flour for 1 cup of black beans rinsed, cooked, drained and pureed. This switch cuts some of the calories and adds protein. Sugar: Refined sugars can be replaced with a variety of healthier sugar substitutes. Stevia leaf extract (0 calorie sweetener), coconut sugar (loaded with potassium), real maple syrup or honey (rich in antioxidants), or unsweetened apple sauce are all great sugar substitutes. Oils: Substituting oils for an unsweetened applesauce will add moisture and flavor while cutting a substantial amount of fat and calories. Butter: Swapping 1 cup of butter with ½ cup of butter and ¼ cup of non-fat Greek yogurt will cut the fat in half and quadruple the amount of protein in the recipe. So, there you have it! Recipes to try, ingredients to keep on hand, and the peace of mind that you CAN enjoy the holiday functions, indulge in some favorite dishes, and stay the course toward your goals well after the holidays are over. Enjoy!